February is not for the faint hearted, I think. nor the bravado of winter. We find ourselves in that in-between time, a wonderful time to both review and look ahead. In the past six months, you all have accomplished the nearly impossible – moved a group of people connected only by their love for each other and this faith from one building to another after many, many, many years of wondering, worrying, plotting and planning, hemming and hawing at times, no doubt – after all that, you did it. Moved. And we are going to celebrate all of that this spring at our formal building dedication. But before that, while we are here in the mid-winter time of reflection, let us also go inward, remembering who we are at our best and who we are called to be. One of the things Dale and I have learned in our 32 years together is to distinguish between an invitation and a request. How many of us have gone along and done something we didn’t really want to do, then perhaps complained about it later only to be asked, “but why did you come, then?” “Because you asked me to,” might be the reply. It’s helpful if in our asking we can make clear if something is merely an invitation or an actual request. On Sunday, February 10, my colleague Rev. Dr. Gail Stratton and her colleague singer-activist Effie Burt will come to CVUU to share their with us their experiences working on the lynching memorial in Mississippi. At the 9AM Discussion group, you’ll get a chance to talk with Gail and Effie about the lessons they learned working on this project together. At our 10:30 worship service, Gail will preach and Effie will sing – not to be missed. I invite you. On Sunday, March 10 Rev. 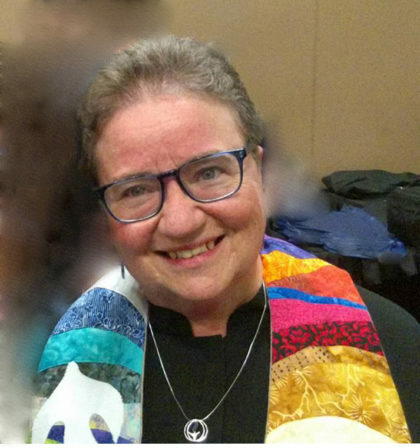 Dr. Hope Johnson will join us in worship at 10:30 and then will lead us in an all-congregation retreat/workshop (Lunch at noon, then workshop from 1 to 4) on how we move forward together in love. This is a request. Please set aside this time to gather in community to talk about the promises we make to each other and how we want to be together as we work to heal our aching world. There will be related activities for our children and childcare for the littlest ones. I invite you, and I request your presence. Sunday, March 10 – we’ll spend the day together beginning with worship at 10:30, ending by 4PM. Come be a part of this important day. As I write this, the government is officially open again, though we can’t be sure for how long. Many of you approached me to ask how you could help those among us have been impacted by the shut down. I am moved by your generosity. So far very few of you have requested help, but please know if you have been struggling financially because of the shut down, your CVUU peeps have got your back. Please let me know if you need some financial assistance as a bridge to your next paycheck. I am so grateful for the opportunity I had this past week to see NEST in action – so many moving parts but everything quite smooth, making space for our guests, preparing and serving them delicious and nourishing food, and keeping watch while they slept so they could feel safer than I imagine they might feel out on the street. This is what I believe all the great faith traditions call and inspire (invite and request) us to do, to notice one another, to see each other’s beauty and each other’s suffering and to help where we can. You all do this magnificently; it is my great honor to be with you.